The high index lens is an excellent choice for those who have large diopters, no matter if it is for myopia, hyperopia or astigmatism. You do need to be careful which of high index you choose, to not spend unnecessary extra money. An ordinary glass or plastic lens has a refractive index of 1.5 and a certain thickness, depending on the number of diopters. Increasing the index of refraction (to 1.6 or 1.7 ...) you get a lens with the same diopters, but thinner, called high index lens. 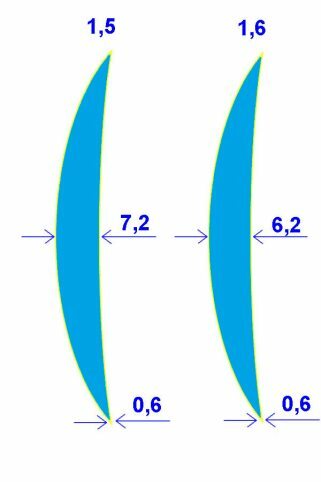 You will choose the index of refraction, according how thin you want to be the lens, and it can be 1.6, 1.67, 1.7, 1.8, 1.9. 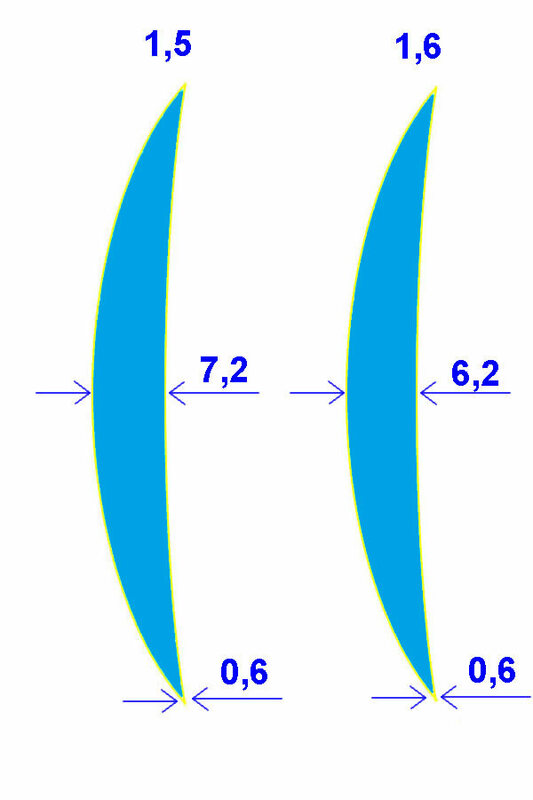 The higher is the index of refraction the thinner will be the same dioptre lens. You have to know that the high index lens has an upper price than commonly used lens, depending on the degree of thinning. For example, lenses with high refractive index like 1.7, 1.8, 1.9, are designed to replace extremely thick normal lenses, and they reduce the thickness significantly, but the price is also high. This is why you don't need to choose a high refractive index if unnecessary, to avoid spending a lot of money. Choose the thinning ratio of lenses after you choose your frame because you may not need the thinnest lens, and you'll save some money. Depending on the dioptre, the difference in thickness between an index of 1.6 and 1.67 is not so high, but there are significant differences in price, so ask your optician to explain how the glasses will look with both indices and take the right decision, according to price. If you want a complete lens as design and look, you can ask to be custom thinned for the frame you want. It will cost you more, but it will be the perfect match. Let’s say you have hyperopia and a higher dioptre than +4.00. 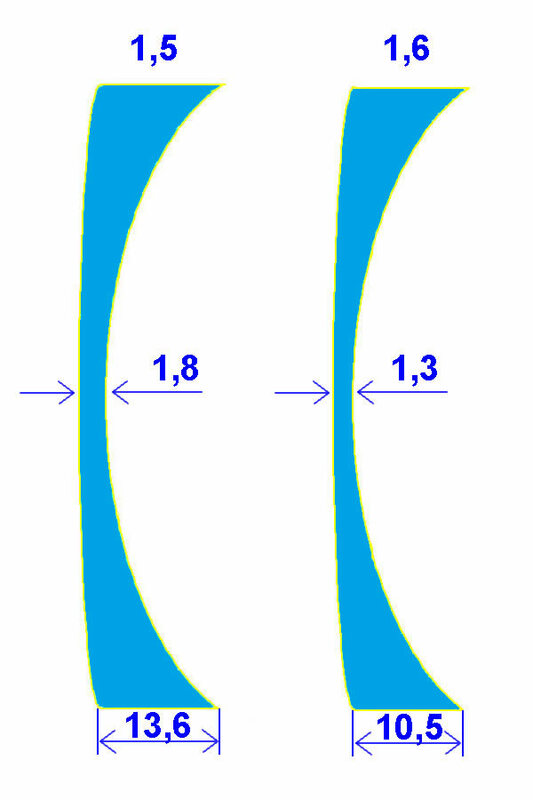 Being a convex lens (+), it will be thinner at the edge and thicker at the middle. This rule is applied also at lenses with lower diopters like +3.00, +2.00. If you have myopia, your lenses are concave (-) and let’s say the dioptre is -4.00 or bigger. You have to consider that the lens is thinner at the middle and thicker at the edges, so after grinding you will remain with the thinner part of the lens. I have to remind you about other specific types of thinning for lenses. It is about reaching the thickness required for mounting the lens in the frame. Sometimes is essential that the edge of the lens to be exactly 1.8 mm, for mounting it in a rimless or semi-rimless frame. This thinning or thickening (if the lens is too thin) is applied on demand, based on the frame shape, and this is an extra service and is not for free. The lens with high index of refraction can have the entire series of coatings like normal lenses, for a fee. Especially you can ask the hardening for lens strength and anti-reflective coating because a lens with high index of refraction, reflects a higher percentage of light than a normal lens. I suggest you the high index lens if you have large diopters and the common lenses are thick and unaesthetic. Even in this situation, before choosing, have a talk with your optician to see if the high index is right for you and which index of refraction is the one for your lenses because the price depends on these choices.